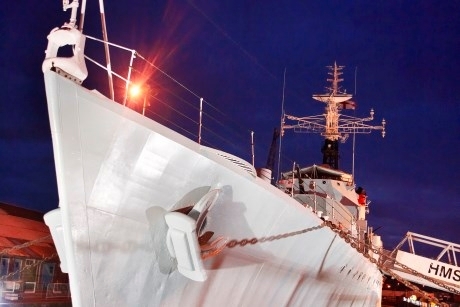 The Historic Dockyard Chatham is now offering overnight stays on board the HMS Cavalier for schools. The HMS Cavalier sleepover experience will allow education groups to sleep on board the Royal Navy’s last operational Second World War destroyer HMS Cavalier. The evening will include a tour of the ship and an evening of naval activities – as well as breakfast in the morning. Teachers can also arrange other activities and workshops for an additional price. These include Missile Crew, Warship Workshop and Dockyard Discovery. The Missile Crew activity will see students becoming part of a missile firing crew, whose orders are to design and launch a replacement for the SEACAT anti-aircraft system. And when taking part in the Dockyard Discovery workshop, a dockyard expert will set and guide three different challenges. The pupils will then be tasked with using written and visual clues to take on these challenges and discover the secrets of the dockyard and how they link to the HMS Cavalier. Schools can also pre-book evening meals and packed lunches. Schools can also choose to explore The Historic Dockyard Chatham either the day of the overnight stay or the following morning once the experience has finished. The attraction consists of seven main elements. These include three historic warships, HMS Gannet, HMS Cavalier and HMS Ocelot, a Georgian and Victorian rope factory, and Lifeboat, a museum about the work of the Royal National Lifeboat Institution which has 17 historic vessels. There are plenty of learning opportunities at The Historic Dockyard Chatham, for all Key Stages and with links to the National Curriculum. For example the Key Stage 2 Beyond 1066: Second World War Package can be combined with the overnight stay. One workshop in this package is Take Cover! Air Raid Experience. During this activity, schools will visit the museums World War Two air raid shelter. Inside, they can experience the sights, smells and sounds of the period, and read about a wartime child’s personal account of their time spent in the shelter. Pupils will sing wartime songs and venture back into the modern world once the all clear sounds. This particular activity links in with English (spoken language, reading comprehension), History and Music. Crash Out on Cavalier sleepover accommodation costs £25 per pupil, including breakfast and the themed activity programme. For more information call 01634-823815 or visit www.thedockyard.co.uk.